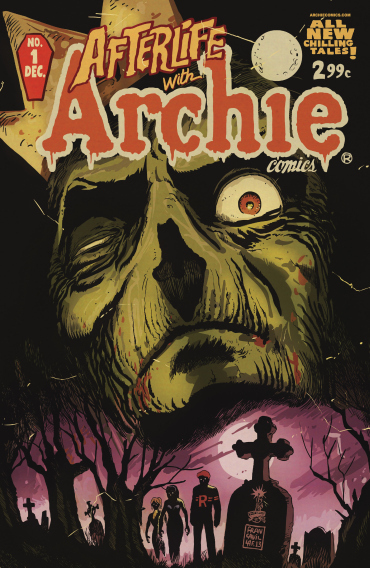 I just finished reading Afterlife With Archie #1, and wow! This series obviously combines the world of Archie with the world of movie and comic book horror. But boy, does it ever do a good job! There are so many nods to classic horror icons in just the first issue that I was sitting here chuckling along through the whole thing. Let me tell you, I don’t usually laugh out loud when I’m reading comics, but this one got me! They’ve got the perfect formula for this one: Take the Archie universe, give it a more mature artistic look with modern, believable dialogue, and then throw in some serious drama that you would never see on the streets of the canon Riverdale. It really manages to pull at your heartstrings too, and the creators were right in their interview at the end of the book when they said that they thought it would have a bigger impact when characters that you know and love are in these situations rather than just some new character who was introduced solely for the purpose of the story. My only reservation with this book is that it’s been confirmed as an ongoing series, and it makes me wonder what they’ll do after all of the major characters have been zombified. Where do you go from there? Do you cure some of them? But then why don’t they just cure them all? These questions are what have me worried, but also what will keep me coming back for more. Let’s just say that I preordered the trade immediately after reading the first issue. Want to check it out yourself? You can get the first issue here, or preorder the trade here, or pick them up at your local comic shop! What do I do for a living? I inspect electronic components in an attempt to validate their authenticity. Does that sound boring to you, or would you like to know more? Well, follow me on a magical journey through the land of counterfeit and refurbished electronics! 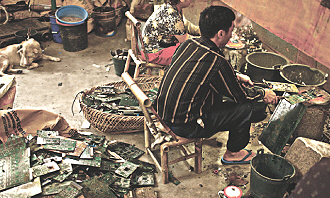 If you live in, say, China, and your uncle/brother/neighbor has somehow landed a contract to accept electronics waste from some far-off and fanciful sounding country, you’ve just got yourself a new job! Sitting over a barrel with a bonfire burning inside of it all day while prying chips off of old circuit boards may sound like fun at first, but I bet it loses its charm quickly. The fire actually helps to melt the solder that holds the components onto the board, and then it’s just a quick flip of the wrist to get those chips off and into a collecting tray of some sort. What does all of this have to do with what I do? Read on! 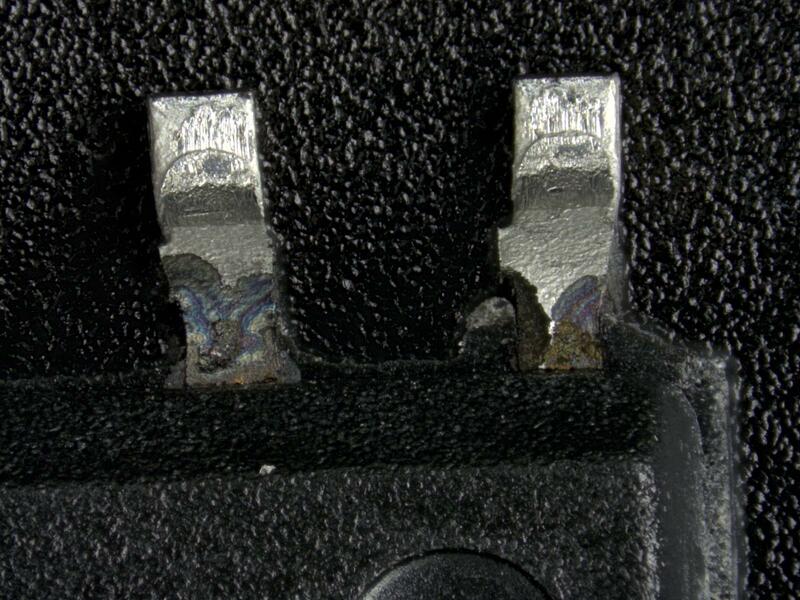 After you pry those chips off, they’re not in very usable condition, owing to the fact that you just pulled all of the solder off that makes contact with the circuit board. So your next step is going to be to put new solder balls on in place of the old ones. 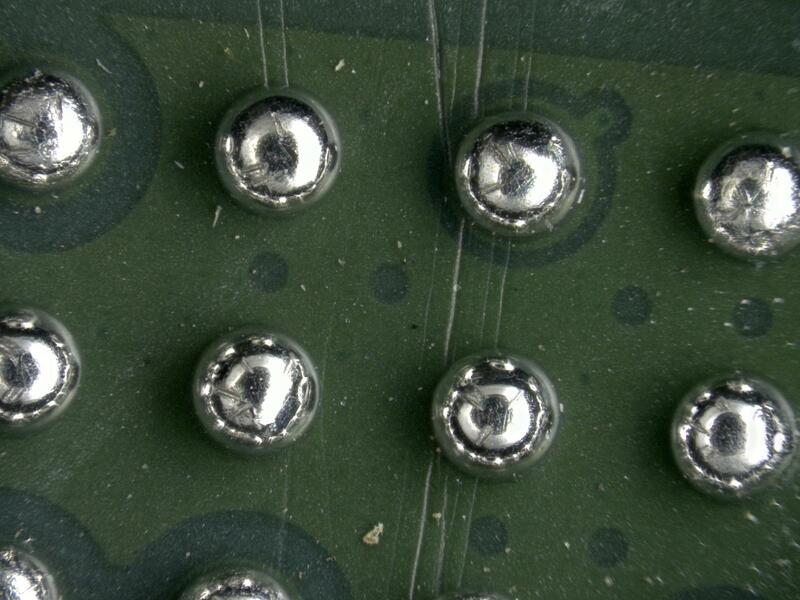 This may actually be done by machine, and in reality they do a pretty good job of this, making it very difficult to tell the difference between refurbished solder balls and ones done by the manufacturer. The thing that they can’t erase, however, is the scratches that they made on the underside of the chip board while they were prying it off of the old application. This is one of the things that I look for in my microscope. 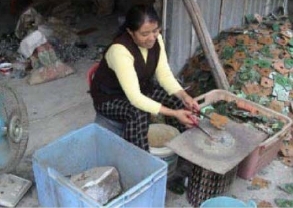 Now, say that the chips that you just harvested aren’t worth a whole lot of money. Maybe they’re 10+ years old and not many people are using them anymore, or maybe they weren’t that great in the first place. You just wasted all of that time! But what if they’re the same size as another chip that’s worth a whole lot more? Well, get out your sandpaper, because it’s time for that chip to transform into cold, hard cash! 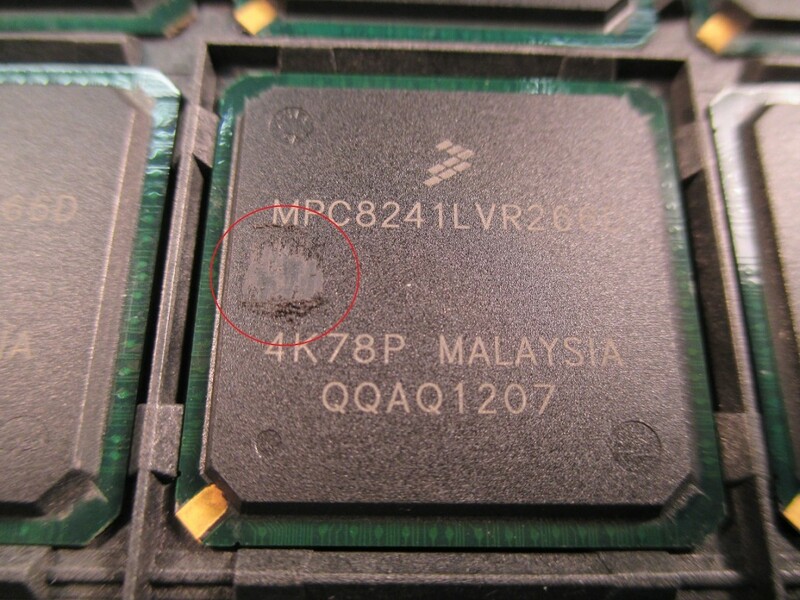 By sanding off the original part marking, and then applying a layer of “blacktop” to the surface, then painting on the marking of a much more valuable chip, or maybe even the same chip but with a newer manufacture date on it, you’ve just made a bunch of money. This is another thing that I’m looking for all day, blacktopping, and it varies from very obvious to almost as good as the real thing. So, my job is to detect these counterfeit components and prevent them from being sold as the real thing. Not all of the counterfeiters are as primitive as what I described above, some are actually quite high tech and professional, which means that they’re even better at making a part look legitimate. There are other things that I keep an eye out for too: Capacitors that don’t have anything inside of them, moisture sensitive parts that people have left out in the rain, parts that are dirty, corroded, damaged, you get the idea. Also high on the list is if the vendor has sent us the wrong parts altogether, which isn’t always as easy to figure out as you’d think, owing to the fact that some of the markings on these things are really teeny tiny. Now, all of these things don’t always happen at the same time. Maybe the part is just blacktopped, or maybe it’s only reballed, or maybe it’s a little rusty but not any of the other things. 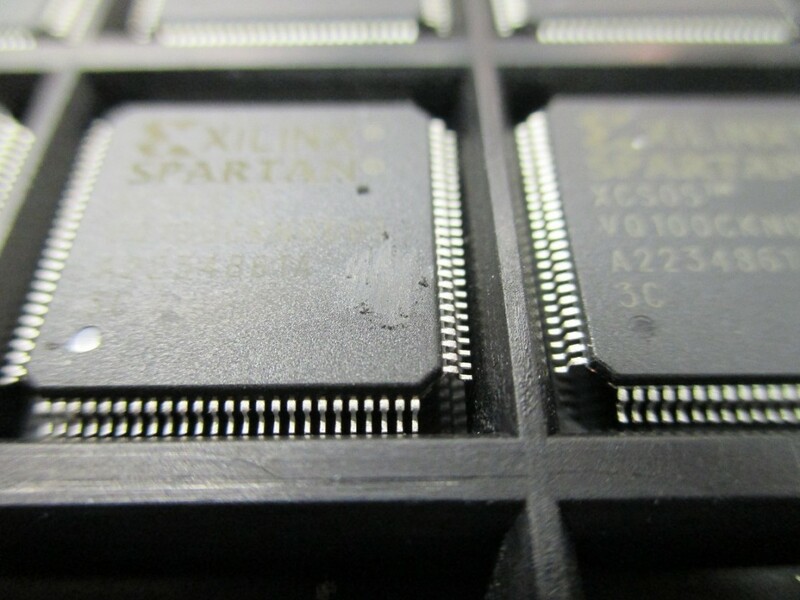 I have to keep a sharp eye out for all of these issues, and there are a whole lot of different electronic components out there, so it’s something new every day. It keeps things interesting! Tune in next time, when I’ll let you know some of the techniques that we use to detect those rascally electronics counterfeiters! 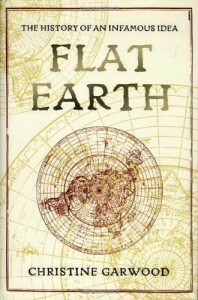 I recently finished reading a book about the history of the idea of the Earth being flat. At first glance, it would seem that this is a concept that has deep historical roots, and that was only widely disproved during mid-to-late Renaissance times, but this is actually not the case. According to the writer, the idea of a flat Earth wasn’t something that was accepted by the intelligentsia even during Roman and Medieval times, and has actually only seen a true revival during more recent times. The idea that scholars during the Middle Ages believed in a planar Earth and were only disproved by Columbus’s voyage is actually a modern invention, an embellishment on that famous journey of the Niña, Pinta, and Santa Maria. A travelling salesman/patent medicine charlatan who went by the name of “Parallax” actually pushed the idea back into common discussion in the 1860′s. The mid 1800′s were a time when professional science was just starting to come into its own, and Parallax saw an opportunity to point out the inconsistencies between the scientific fact of a globular Earth and the “common sense” idea that our visual perception indicates that the Earth has a flat surface. He also relied on biblical quotations and examples to support his theory, something that would heavily influence those who followed him. Parallax wrote a textbook on the subject, and then went on a lecture tour around England to sell his idea to the public. He was apparently a very persuasive speaker, and was able to hold his own in a debate despite the fact that a majority of the people who showed up to his lectures were there to heckle him. He actually had a very successful career, and his writings became the guiding principles for all anti-globularists who followed his example. It’s not clear whether Parallax actually believed what he was trying to sell, but most of those who were to follow were true believers through and through whose perceptions tended to be influenced by their religious fundamentalism. The interesting thing to me about the flat earthers is the arc of their popularity, since their crusade has many things in common with modern creationists/”intelligent design” enthusiasts. They were originally pitied and belittled, but then over time they built up a bit of a following and actually had a small global community of believers. Even during the modern era, there were actually whole communities of people who subscribed to the flat Earth principle, such as the inhabitants of the religious settlement of “Zion” in Illinois in the early 1900′s. The part of the story that gives me hope for the triumph of reason over illogical ideas is the gradual decline of flat earthism during the mid-late 20th century. Fewer and fewer people bought into the idea until eventually it was used mostly as a joke and only forwarded by a few very misguided but overall harmless individuals. A group of writers in Canada actually used the idea as a way to spur thought on the unthinking belief of the public in the teachings of science. They didn’t actually believe that the Earth was flat, but wrote a number of articles and made appearances on TV promoting the topic as a kind of avant-garde protest against the unshakable authority of the scientific establishment. The last true champion of flat Earth theory passed away in 2001, leaving his few remaining adherents to fade into obscurity. This is only a summary of the topics covered in Christine Garwood’s excellent novel on the subject. I recommend checking it out yourself if this was at all thought-provoking for you. Hello, world indeed! I have always put a comma between those two words when I write my “first program” in a new language, and I suppose that tradition will continue here. This is the first post on my new blog, which I hope will be filled with interesting text. I don’t really have a focus for my madness yet, but I’ll try to make my ramblings coherent at the very least. Let’s enjoy this adventure down the winding river of my mind together and see where the currents take us!